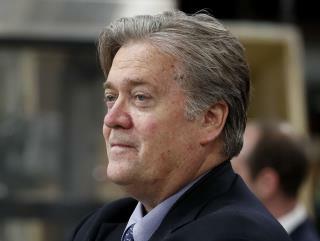 (Newser) – Steve Bannon, President Trump's former chief strategist, met secretly with "the second most powerful person in China" last week during a trip to Beijing, reports the Financial Times. Wang Qishan—second only to President Xi Jinping as anti-corruption tsar within China's Community Party—met with Bannon for 90 minutes at the Chinese leadership compound, according to the report. Chinese officials reached out to Bannon—who has said the US is at "economic war" with China—to get his thoughts on economic nationalism and populist movements, sources tell FT. Bannon reportedly flew to China from Hong Kong, where he'd given a speech on the same subjects, hosted by a Chinese state-owned brokerage and investment group. The Russian's had their turn. Now they are selling us out to the Chinese.